A French beef stew recipe which in France is known as Daube, is a traditional family meal and believe me there is nothing quite like it! It is called daube because of the old earthenware container it was cooked in. 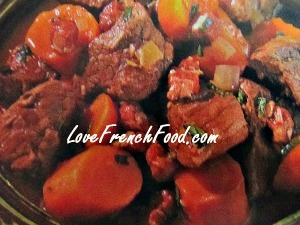 There are variations of this beef stew recipe but they are all fantastic. It is best started the day before as it improves in flavour. As it is a meal made ahead, it is perfect for entertaining. It is also a favourite meal eaten on Christmas Eve in France with all the family together. • 4 lbs (1.8kg) stewing beef cut in thick chunks. 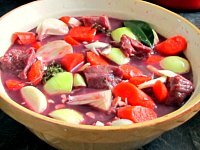 • Place the pieces of beef together with the chopped carrots, onions, studded onion and bouquet garni in a large non metallic bowl. • Pour over the red wine and leave to marinate over night. • Heat the olive oil in a deep heavy bottomed frying pan and brown the pieces of bacon. Place them in a large heavy bottomed casserole dish. • Now brown the pieces of beef, a small amount at a time and place these also in the casserole dish. • Add the rest of the marinade to the pan. • Add the tomatoes and tomato paste. • Bring to the boil and immediately reduce heat and simmer for about four hours. The marinade will reduce by about 3/4 but you can add a little water if it reduces too much. It should be a good consistency and not watery. • Add a handful of black olives and some grated rind and juice of one orange if you like but it is equally good without. Your delicious beef stew recipe is wonderful served with creamy mashed potato, polenta or sauteed potatoes. Parsley covered carrots also go really well with it. And of course a glass of red wine such as Burgundy will complete your meal!